Andrzej Jackowski (b. 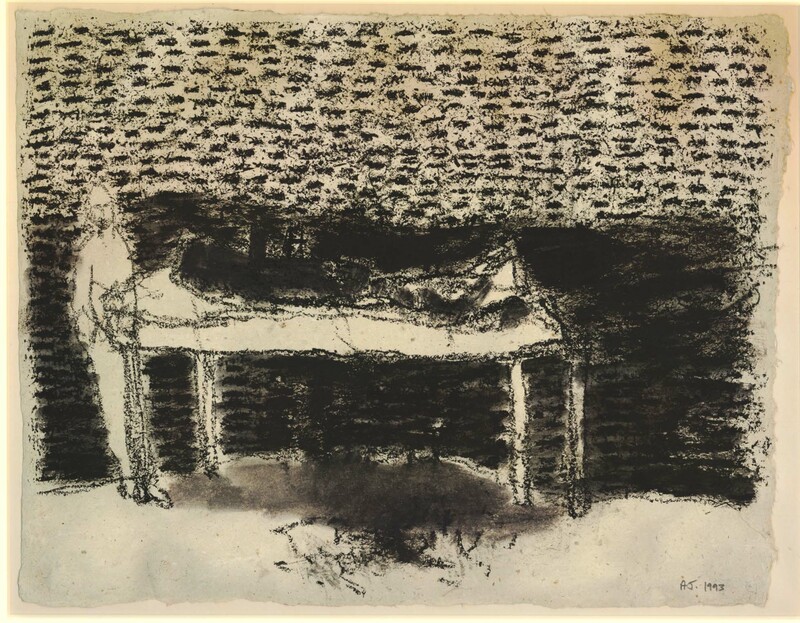 1947), Hearing Voices IV, 1993. Reproduced by permission of the artist. The exhibition Living with gods: peoples, places and worlds beyond contains many poignant and powerful reminders of the persistence and value of prayer. Whether uttered silently or aloud, words of devotion form part of a dialogue with a being whose existence can be understood (or denied) in different ways. In that sense, they are of great interest to psychologists, who have sometimes examined them as an example of ‘inner speech’, the silent conversations that many of us report accompanying our daily lives. Without having to commit to any metaphysics or deny their spiritual meaning, psychologists like me can try to understand the processes through which we conduct internal dialogues with varied conversational partners, whether they be absent friends, the voices of the dead, imaginary entities or supernatural beings. 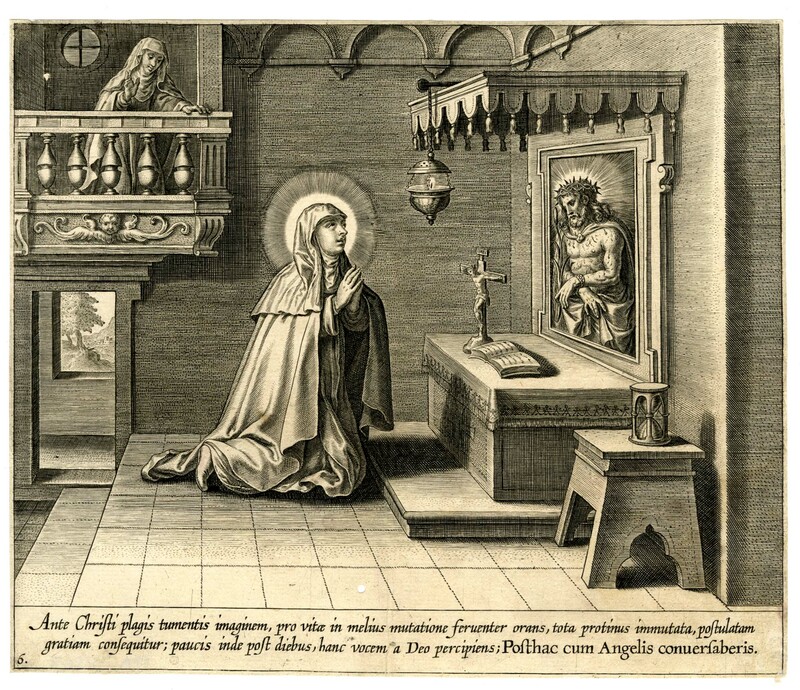 Adriaen Collaert (c. 1560–1618), Plate 6 from the series The Life of Teresa of Avila showing Teresa hearing God’s voice. Engraving, 1613. My research in the last few years has had a particular focus on these internal dialogues. I’m interested in how all these words get into our heads, what they are doing there, and what the experience of inner speech is like. An often distressing counterpart to these ordinary internal conversations is the experience of hearing voices when no one is present – often seen as a sign of severe mental illness (such as schizophrenia) but also associated with a range of other psychiatric diagnoses. Outside the psychiatric clinic, researchers are now beginning to understand that hearing voices is a part of everyday life for a significant minority of people who are not distressed by their experiences and who are not mentally ill. Casting the net even wider, somewhere between 5 and 15 per cent of the population will have occasional, fleeting voice-hearing experiences, such as hearing one’s name called when there is no one around. Hearing voices is a part of human experience that crosses continents and historical periods. In my lecture as part of the public programme of events related to the exhibition, I will focus on a figure who left such a rich description of her experiences that it still resonates with us 600 years later. Margery Kempe was a colourful figure. A mother of fourteen who had failed in business twice, she took to the road in her forties to try to persuade princes and bishops that she was hearing the voice of God. It was a dangerous path to tread. Margery wrote about her experiences (by dictating them to an amanuensis) in a unique manuscript, The Book of Margery Kempe, now housed in the British Library. This extraordinary text is thought to be the first autobiography in the English language. In our Hearing the Voice project based at Durham University and funded by the Wellcome Trust, we are engaging with Margery’s text from a range of different disciplinary perspectives, using methods from the humanities to explore the nuances of her account and their significance for scientific theorising. Sometimes Margery hears the voice of God as clearly as if there had been another person in the room with her. At other times, the experience is more ambiguous – the Holy Spirit announces itself to her as a rushing sound, like a pair of bellows, or as the sound of a robin or a dove. On one occasion a voice counsels Margery to travel to the nearby city of Norwich – then the second biggest city in England – to take advice on her experiences from ‘Dame Julian’. This is a reference to the celebrated mystic Julian of Norwich, author of Revelations of Divine Love, the first book in English known to have been written by a woman. Just as voice-hearers today – often inspired by the international Hearing Voices Movement – get together to discuss their experiences away from the diagnosing eye of psychiatry, so these two literary giants spent ‘many days’ together in ‘holy dalyawns’ in and around Julian’s anchorite’s cell. I like to think of the meeting in Norwich, somewhere around the year 1415, as the first hearing voices group. Interdisciplinary research is sometimes put forward as the sole pathway to a higher truth. The reality is that it frequently fails, for reasons such as the time and effort involved in bringing researchers from different disciplines into a shared body of understanding, while at the same time respecting and valuing disciplinary expertise. I can honestly say that reading and thinking about Margery Kempe, along with the works of her commentators such as Corinne Saunders, Barry Windeatt and Anthony Bale, has changed the way I think scientifically about inner speech and voice-hearing. In her account of her ‘wondirful revelacyons’, Margery Kempe gives us a resonant image of what her modern editor Barry Windeatt has called ‘a praying mind talking to itself’. Charles Fernyhough is the author of The Voices Within: The history and science of how we talk to ourselves (UK: Profile Books/Wellcome Collection; US: Basic Books). The accompanying BBC Radio 4 series was broadcast between 23 October and 6 December 2017 and is now available to download as a podcast.